Thanksgiving turkeys come in all sizes. And some are raised differently than others. Gary Angell’s turkeys roam free and eat a homemade mixture of what he calls “real food.” They cost more than supermarket varieties, yet customers reserve their holiday birds months in advance. 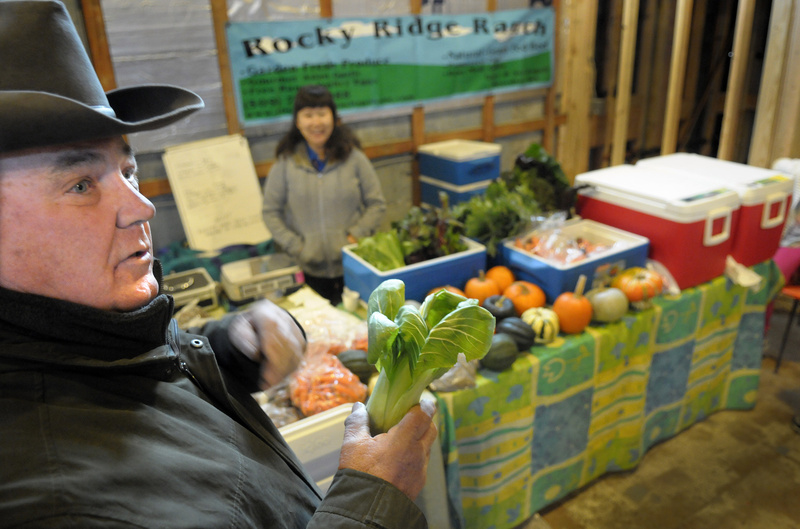 Angell and his wife, So YiDeuke, operate Rocky Ridge Ranch, specializing in naturally raised meats, free-range poultry and organic vegetables. We chatted with Angell at the South Perry District’s Thursday Market. S-R: Were you raised on a farm? Angell: More or less. My mother and stepfather were raised on farms. He was a roustabout, so we moved around a lot. I spent most of my time on a cattle ranch in Montana, and all through my teenage years I’d work the haying season each summer. Then I went in the Army for 20 years. S-R: What did you do in the Army? Angell: I started out in the paratroopers. When Vietnam came along, I got commissioned and was in logistics. The last few years, I had higher-level staff positions in Korea, and that’s where I met my wife. S-R: How’d you end up on Rocky Ridge Ranch? Angell: I was working at a Tacoma shipyard when the West Coast shipyards started shutting down. I decided to look for a hobby farm we could afford – 20 acres or something. We drove around the Northwest until we met a real estate agent in Chewelah who said, “I know just the farm for you,” and he took us out to the farm we have today. It was 160 acres, and the owners made us an offer we couldn’t refuse. That was in ’83. I bought another 240 acres connected to it six years later. S-R: That doesn’t sound like a hobby farm. Angell: I started out being a weekend wheat farmer and homesteading the place, because there wasn’t much there. Then we went into growing calves, and later we got cows and goats. My wife grew Asian garlic, and we did real well with that for a few years. But Costco started importing Chinese garlic, and overnight the price dropped from $20 a pound to $1 a pound. S-R: How did you adjust? Angell: We had a produce garden for our own use. Some people visiting the farm saw it and bought a bunch of stuff from my wife, so we made the garden a little bigger. Then my wife started selling our grass-fed beef directly to customers instead of through the auctions to make more margin on it. Customers asked me to grow pigs for them. And our backyard chicken lot grew because of demand for eggs. We’d always raised a dozen turkeys, and as people heard about us we did more. S-R: How many turkeys do you raise now? Angell: We usually start with 100. When they’re young, you lose quite a few. Once they get bigger, they do real well. This year we only did 50, because of the economy. To raise a turkey natural like I do – on pasture with real food, I call it – costs me $40 to $45 by the time I get it processed, and if I don’t sell those, that’s a big ouch in the pocketbook. S-R: How are your turkeys different from those typically found in supermarkets? Angell: First of all, I make the feed myself. It’s GMO-free and corn- and soy-free. I use mostly local peas and barley. And they’re not fed any medications. S-R: How much do they cost? Angell: I charge $3.50 a pound. You can get a commercial turkey for 59 cents a pound, but it doesn’t have the taste and has a lot more fat than ours. S-R: Is there such a thing as a typical work day? Angell: No, except that it’s every day. My wife is an early bird. She starts out at 4 in the morning. I usually don’t start until about 7. And on a market day, we don’t finish up until at least 8 p.m. – in summertime, even later. S-R: Do you ever get a break? Angell: This year we’ve only had three days off, but we take a break from our regular deliveries in January and February. S-R: How have your farming practices evolved? Angell: My wife grew up raising produce in Korea, so she’s an organic purist. She won’t even let me use organic-approved sprays. My background is in livestock, and I wanted to have a niche product because it’s hard to compete with the big commercial meat operations. The only way to make a profit is to have a premium product people are willing to pay more for. S-R: What do you like most about farming? Angell: It’s in my blood. I think it goes back to when I was happiest as a child when we lived on farms. Even when I was in Vietnam in the middle of the war, I was checking out local farms to seeing how they did things. That whole area over there is beautiful farmland. S-R: What do you like least about farming? Angell: Driving back and forth to the city. We put 40,000 miles a year on our vehicles. If it’s not going to market, it’s going to get supplies or taking animals somewhere to get processed. S-R: Do customers visit the farm? Angell: Yes. Some come for recreation, and bring the kids along to chase baby pigs. Others volunteer to do a little labor. And some come out to check if we’re really doing what we’re saying, because there are a lot of farmers market vendors who are phonies. S-R: What about the farm surprises visitors the most? Angell: The first thing is the smell. It’s nature, and that usually includes some manure. The second thing is bugs. S-R: Are you optimistic about the future of small, family-owned farms? Angell: I was until this year, but this economic slump has really taken a bite out. But I think small farms are something that should be promoted, because they’re an alternative source of food in case of any big natural disaster. S-R: What can people do to ensure that small, family-owned farms are still around in 20 years? Angell: Two things. Make sure politicians don’t represent large, commercial operations to the point that they put us out of business. And, of course, buy our products based on their nutritional value. Spokane freelance writer Michael Guilfoil can be reached via email at mguilfoil@comcast.net.